We recently had the opportunity to meet with Philippe Heron from Laser Pegs at this year’s Australian Toy Hobby & Licensing Fair in March. We spoke to Philippe about Laser Pegs and the origins of the business. We also discussed their plans for the Australian & New Zealand markets now and in the future. Philippe, for those who are not familiar with Laser Pegs; can you provide a brief introduction to Laser Pegs and its origins? Established in 2009 and headquartered in Sarasota (Florida), Laser Pegs is the original Lighted Construction Set. Laser Pegs encourages forward thinking and multi-dimensional play. 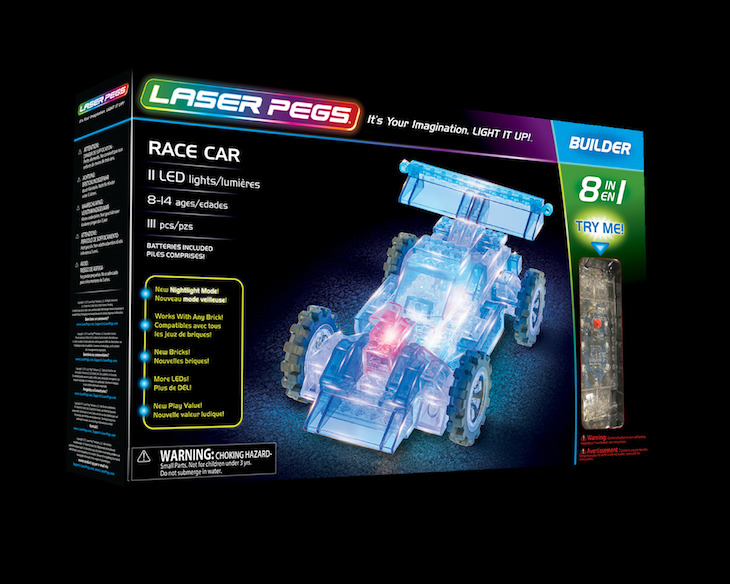 Laser Pegs products combine two things that nearly every kid loves; light and building things. The product lines are based on a “Slide, Stack & Spin” play pattern that allows you to build anything you can imagine like vehicles, dinosaurs, robots or even spaceships! Year after year, Laser Pegs has been recognised as an award winning toy. To date, the company has been honoured with over 50 awards because of its “Slide, Stack & Spin” play pattern by esteemed organisations like Dr. Toy, Oppenheim Toy Portfolio, Parenting magazine and Good Housekeeping magazine. Its merits in science, technology, engineering and mathematics (STEM) learning have been well documented, making Laser Pegs one of the best selling toys in the construction market. With unique categories, over 20 items in its 2017 product lineup and retail presence in more than 70 countries, the brand continues to establish itself as the global standard in lighted construction. How do Laser Pegs differ from other products on the market in the construction & puzzle categories? Laser Pegs is a technology, education, entertainment and construction toy Company with the following original objectives: Intellectual Property surrounding illumination and microchip controlled interactivity; application of technology into educational and STEM learning product ranges; innovate, develop, market and distribute toys in the “Tech-Construction” category. Laser Pegs are available in-stores and online; are both platforms equally important or do you find that one tends to be more popular with this product? We see a fast growing trend for internet sales as the smartphone market is developing so quickly along with increased internet speeds via 4G and soon 5G. This shift obviously drives more consumers towards internet sales. In the USA, internet sales account for a higher share of our sales than in Europe or Asia, but the trend is towards a worldwide growth of sales through the internet and the many online channels. From a licensing point-of-view, do you have any plans to move Laser Pegs into the licensing market with licensed options of your products? Our distribution will have covered all key markets by the end of 2017 and we certainly will look at opportunities that could make sense both for Laser Pegs and for brand owners seeking new licensee opportunities and categories. Remember though, the Laser Pegs DNA is the light & construction category. Speaking specifically from a market angle; what are the strongest markets for Laser Pegs throughout the world so far? USA, Canada, France, Benelux, Switzerland, Denmark, Australia & the Middle East; we are also developing fast in all other European markets. Crayola Italy will introduce Laser Pegs this year end and we are establishing nicely in a very specific market which is key in the toy industry; Germany. Australia & New Zealand are fast growing markets; who are you working with in these markets for Laser Pegs for Sales & Marketing? We have operated a drastic change in our distributorship which started in early 2017. We are very excited to have appointed Zimbler from Melbourne (Australia) who have a very strong name in the market and who are a highly recognised family owned company. Zimbler are committed to brands and they have a very dedicated sales team which I have been very happy to meet during the recent Toy Hobby & Licensing Fair in Melbourne in March. We anticipate this new relationship to provide a strong and mutually profitable partnership between Laser Pegs and Zimbler. It is also exciting that we will receive support from Kidstuff; they will allocate a very unique space to Laser Pegs in their stores which is great. Toys “R” Us are also a very active retailer for Laser Pegs and we hope to have some accounts offering Laser Pegs distribution from 2018. Things take time to address and correct but we are hopeful to see Australia becoming an even stronger market for us in the future! Finally, from a marketing point of view; do you have content that supports the products in terms of social media, television or digital media? TV commercials and digital media are part of our communication plans for Laser Pegs and we are currently working on such a TV commercial. We are also excited to be filming extra footage for digital media as well. All our distributors tend to prefer digital media to national TV campaigns simply because digital media offers a chance to specifically reach our target market at a much lower cost than a national TV campaign. We also all know that kids are now spending more and more time on smartphones and tablets than in front of the TV… so now we have to follow them!